Churches need to be planted and then quickly need to plant other churches. In order to start a movement and plant 1,000 churches in your lifetime, you need to think about church planting through the lens of rabbits and elephants. Years ago, I remember preaching at a conference where I felt like the odd man out. It was like that song from Sesame Street, “One of these things is not like the others…” The conference was on church planting, but it seemed like every speaker had started a church that had grown to at least 5,000 people—and some 25,000. When it was my turn to preach, I decided to shoot straight and say it like it was. “Now listen. This is probably not what you’re going to experience when you plant a church. When you drove onto this campus, you drove on four lane roads called ‘Purpose Drive’ and ‘Saddleback Parkway.’ When you got out of your car, people greeted you and music was playing in the background. And now look, you’re with 5,000 people in this room. Yet, for a movement, we need rapid reproduction, not slow addition. Churches need to be planted and then quickly need to plant other churches. And, yes, they can grow to be elephants, but they need to start with a stronger focus on reproduction, early and often. Consider this fact. Elephants have the longest gestation period in nature. After getting pregnant, a female elephant will carry her calf inside of her for nearly two full years! It’s almost unheard of for more than one calf to be born at a time. Upon birth, the calf is able to immediately stand up on his or her feet and walk a few steps. his or her mother’s milk for about six months. At that point, the calf will begin transitioning to solid food, while continuing to nurse until age three. This whole cycle won’t start again for the mother until her calf is fully weaned. And for the calf, it will take 15 years before he or she begins his or her own reproductive life. 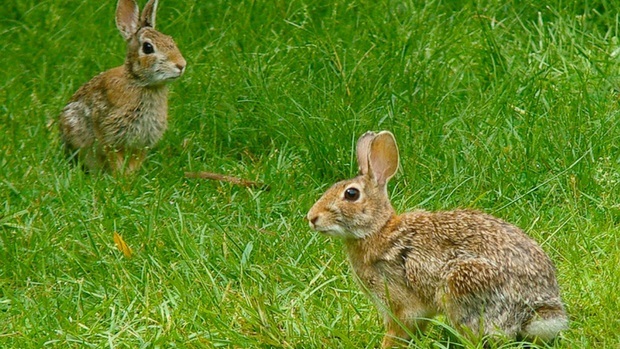 it’s possible for a female rabbit to be impregnated again. That means a female rabbit can potentially have one litter per month! And as early as six months into their life, rabbits will begin reproducing. What a difference! Let’s just take a moment and do the math. If a rabbit has an average of three female babies per litter per month, then at the end of year one, there will be 37 female rabbits (including the mother). If all 37 reproduce at the same rate, then at the end of year two, there will be a total of 1,369 female rabbits (including the original 37). At the end of year three, it jumps to 50,653 and so on and so on. Compare that to elephants. At the end of year one, there’s only one, as the calf is still in the mother. At the end of year two, there are now two elephants: the mother and the calf. At the end of year three, there are still two. If the female elephant gets impregnated after weaning her calf at the end of year three, then it wouldn’t be until year five that the number of elephants jumps to an astronomically high number—three. Now, don’t paint us as anti-megachurch here. As I write this, I am the interim teaching pastor of the oldest extant megachurch in the Protestant world, Moody Church. It has 3,700 seats and occupies entire city blocks in downtown Chicago. But, I can assure you, Moody Church knows that in its church planting strategy, the goal is not to plant more Moody Churches (though we would not be offended if some ended up that way!). This is an excerpt from the newest book that I wrote with Daniel Im, 1000 Churches: How Past Movements Did It—And How Your Church Can, Too. You can learn more and download it for free: newchurches.com. SOME QUICK THOUGHTS ON HOUSE CHURCHES: THE GOOD, THE BAD, AND WHY YOU SHOULD BE OPEN TO THEM WHY WOULDN’T ANYONE WANT TO BE FILLED WITH THE HOLY SPIRIT AND BECOME HIS TEMPLE!